One of my favourite parts of going to a gallery is taking it upon myself to walk around to the side of a canvas or try to peer under a sculpture and figure how the magic was created. It is my way of satisfying my own curiosity and trying to see things others don’t. 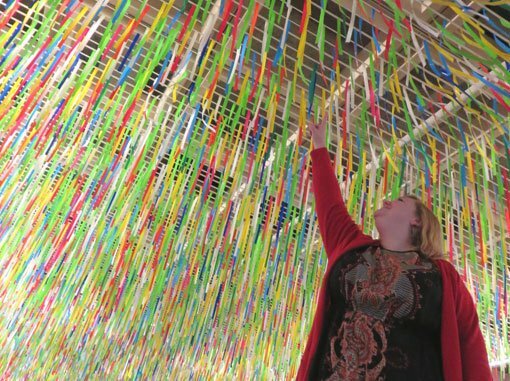 Rally by Nike Savvas is an artwork that made me marvel at its installation and circle back to try and figure out its secrets for myself. 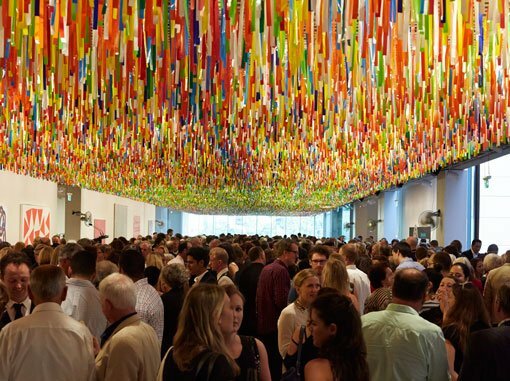 Currently installed in the Gallery’s entrance court, it’s made of over 60,000 individual coloured plastic flags strung together like bunting, stretching an impressive 60 metres along the ceiling. The first time I saw it was at an event where people were jammed in underneath it and I was instantly in awe of its sheer size as well as how a work made up of so many coloured pieces could have undulations of large colour blocks within it. It was only after a while that I noticed that there are fans placed at the sides, which make it shimmy like spirit fingers in sections too. It transforms the entrance into a place of play and adds a real sense of occasion and fun to the event underneath it. As the space fills with music, laughter, conversations and musings, it’s hard to miss the joyful effect Rally has on a crowd. Since then I’ve noticed a completely new way to look at Rally , when I saw some kids lying on the floor peering up into the work. The best bit was that, as I stood and watched, other adults joined them, lying down on the ground to look up at the art. It was as if some unspoken message had been passed from Rally to them that gave permission to break out of ‘normal’ gallery behaviour and experience it in a new way. Whether you are trying to figure out its workings, being inspired by its colour and sense of fun or simply having it as the unexpected starting point to your experience in the Gallery, Rally really is an artwork that just keeps giving. Previous post: Have I got your attention?